I feel like I might be tooting my own horn here a bit - but this news is just too cool to sit on. 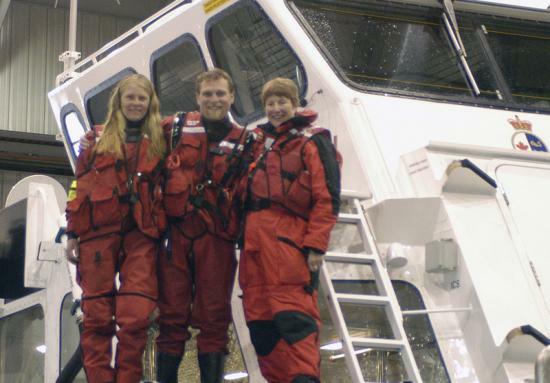 Each year the Canadian Coast Guard Auxiliary - Pacific holds a search and rescue competition (SARCOMP) The 2005 SARCOMP was held in Richmond (Steveston) on 13 /14 May with great success. The overall aim of this event was to: demonstrate SAR skills from the whole region, evaluate training levels throughout the region, provide some valuable training opportunities (not normally available), allow the units to exchange training ideas and approaches, have fun, and lastly, select a Pacific Region Team that will represent the region at the International Search and Rescue Competition (ISAR) 2005. Two teams from the Sunshine Coast participated. From Unit 14 (Gibsons) Sidney Clare, Gord Cuplipp, and Marcel Van der Stelt. From Unit 12 (Halfmoon Bay) Bruce Arbo, Scott Baker, and Kellei Bulmer. In total 24 members from across the Pacific Region consisting of 8 teams of three (one coxswain and two crew) participated in a combination of day and night on-the-water scenarios, knowledge exams, and also a timed marine search and rescue obstacle course. The team from Unit 12 (Halfmoon Bay) won the marine search and rescue obstacle course event which consisted of various seamanship skills including heaving line toss, fire/de-watering pump, and donning and use of SAR and survival gear with a time of 10 mins. and 20 seconds. At the conclusion of SARCOMP the top two coxswains and the top three crew members selected to represent BC at ISAR were announced during the awards dinner. Three of the five members of this years team hail from the Sunshine Coast. Sidney Clare (Unit 14) and Kellei Bulmer (Unit 12) took two of the crew positions and Scott Baker (Unit 12) was selected as the top coxswain and team leader. They will join other CCGA members from West Vancouver and Victoria to receive special training prior to ISAR in Halifax this October.